Can Roger Federer raise his game after 30? But there is a wider fascination with the 16-time grand-slam champion’s age beyond just what his wife Mirka gave him. And whether he had a cake. First, Federer’s birthday sends a little nudge that tennis players will always seem ageless to us. It’s much easier not to think about Rafael Nadal and Novak Djokovic and all the insanity they have achieved in the context of their dates of birth. It just makes one feel wildly inferior. This is certainly true while they are playing, at least. Once they reach the Boris Becker stage, the cobwebs are a little more apparent, especially when Boris can’t seem to distinguish between live action and highlights, another of the past week’s headlines. For the Fedophiles, it is yet another reason to laud and applaud their hero. He has everything: wife, children, fortune, records and now a milestone birthday. The “how great is Federer” parties took place with happy abandon on message boards and social networks around the world. For the naysayers, those who make it their business to pore and predicate on how someone is not as good as they used to be, it’s an equal opportunity. And somewhat sadly, there is truth in a lot of their negativity. As much as they would like to be, tennis players are not modern day Peter Pans. Francesca Schiavone aside, 30 is not the new 20, and every year older is a step towards the end of their career. And that is a frightening thought. Katie O’Brien, the former British No.1, who announced her retirement from tennis last week at the tender age of 25, said that giving up tennis was “not just giving up a career, but giving up a way of life”. Triple that for Federer. Tennis is his heart, soul, income and more. It defines who he is. So, unsurprisingly, in his “Happy birthday to me” message, Federer, being Federer, made it clear that he is not thinking about such things. At least he is telling himself not to. Much like his justifications for making grand-slam semi-finals and quarter-finals rather than winning the things, and being ranked No 3 and No 2 rather than No 1, the mighty Swiss is very good at being positive about himself. Not the “I’m not very good any more” line, by any means. Rather the “I’m still very good, so good that they had to somehow be better” line. That’s a confidence one can only shake one’s head at and admire. Because what Federer has, or at least had, has been extraordinary. From the age of 22 to 27, he averaged 2.3 grand-slam victories per year, equalling Pete Sampras’ previous record of 14 in that time alone. The sweet spot was between the ages of 24-27, when the Swiss won 10 grand-slam titles, taking three out of the possible four in the year on three occasions. How did he do it? First, his style of tennis: there is no player who inspires that “Gosh, I want to play like that” feeling like Federer. Opponents don’t just have to handle a forehand or backhand, they have to cope with the whole thing – who he is, what he’s done, before even getting down to the nitty gritty of his serve, forehand, net play and whatever else you may think his weapons are. He dances and glides his way through matches without breaking a sweat. The legs flying through the air, the torso rotating seamlessly, perfectly coiffed fringe streaming out from beneath colour-coordinated headband, and all the while, his steely gaze fixated on impact between racket and ball. There is also his physique, his economy of movement, and, as a result, his relative lack of injuries. Had Federer been dogged by the sort of physical problems that have affected Rafael Nadal, it might have been a very different tale. Then there are the records: 16 grand-slam singles titles, 285 weeks ranked No 1 in the world, 67 titles, $63,653,278 in prize money, and countless other numbers recorded on the computer since the Swiss turned professional 13 years ago. They make up Federer’s aura of invincibility. Of course, in the context of what Djokovic has achieved recently, what the Swiss had to do to dominate was peanuts. He simply did not have to overcome the strength and depth of opposition that Djokovic has been faced with. But part of that was because everybody thought he was unbeatable. Winning is a habit, and a scary one at that. What else? Sportsmanship. Yes, the teenager with the dodgy blonde highlights used to smash rackets and throw tantrums, but the grown-up Federer can do no wrong, another part of the invincibility players have to face across the net. This is not quite the factor it once was. As he starts to lose more, the Swiss bluntness is becoming rather less charming. Next, the brand. It’s hard to remember a time when “RF” was not on the head of one in five tennis fans. Or the familiar visage graced the sides of taxis and buses. Or performed the perfect trick shot in an internet viral. The Federer effect has done a huge amount for tennis. Just ask the many fans who fly thousands of miles in the hope that they might get the right day and see him play. But, as remarkable as all that is, there is no doubt that he is slowing down. His brave pronouncements on turning 30 were followed quick-step by a second consecutive loss to Jo-Wilfried Tsonga in the third round in Montreal, and a third consecutive loss to Tomas Berdych in Cincinnati, hardly putting weight behind the message. And, the biggest one of all, after winning at least one grand-slam title every year since the age of 21, Federer is nought for six in his past six slams. So, not only is Federer starting to not make the deepest stages of the grand slams, his record-breaking semi-final streak (he reached 23 in a row between Wimbledon 2004 and the 2010 Australian Open) now reduced to a quarter-final streak, he is also losing early in the warm-up tournaments on a regular basis, and against players that he used to swat. For one so used to operating at the very top of the game, it cannot fail to creak open the retirement can of worms. This is a dilemma entirely of its own, because not only is there the need to get one’s existence round the thought of actually not playing tennis any more, there is also the scientific art of deciding when to retire. How do you know if it’s ever going to get any better? If the next good result is just around the corner? Or if you are condemning yourself to an embarrassingly slippery slope that has people feeling sorry for you, in the manner of John McEnroe’s defeat to Kevin Curren at Wimbledon? Bjorn Borg couldn’t handle it, and left the game, in hindsight, far too early. Pete Sampras, on the other hand, kept playing into his 30s, but had a miserable year in his final year as a professional. That 14th grand slam at the US Open title in 2002 may seem like just another part of the fairytale Sampras story, but it was by no means a sure thing, and all the more extraordinary because of that. Andre Agassi may have won two slams over 30, the 2001 and 2003 Australian Opens, the latter at the very grand old age of 32, but he again was anomalous. Which leaves Andres Gomez, who won the 1990 French Open at 30, as the only other non-20-something Grand Slam champ of the past two decades. Go back a bit further through the archives, and there were others who broke the 30-year-old slam champ barrier to bring the total to 18 on the men’s side in the 43 years of the Open era. He’s not wrong. The Australians, in particular, found success in their latter years. Rod Laver won the second of his calendar grand slams in 1969 at the age of 30. Ken Rosewall won four majors and reached eight finals, all after his 33rd birthday. Jimmy Connors had just turned 30 when won the 1982 US Open final against Ivan Lendl. Connors won the Open the following year. Arthur Ashe, five days shy of 32nd birthday, won Wimbledon in 1975. “I think Federer, at 30 years old, still is young,” Connors said recently. Could he be No 1 again? “Certainly if he’s willing to put in the time and do what it takes, I don’t see why not. But now it’s not just one guy he has to beat. He has Djokovic, Nadal, [Andy] Murray, a host of guys that are coming up and are looking for his scalp. And if it’s going to happen, then the US Open, with its quick courts and light balls – music to Federer’s aggressive style of play – is a good bet. It’s not just a male thing either. Schiavone’s heartwarming French Open triumph in 2010, her exuberant, excited chatter as she covered the Coupe Suzanne Lenglen in kisses, showed that good things can come to those who wait. Serena Williams too, approaching 30, is the clear favourite for the US Open. And before it was her, who was it? Kim Clijsters. Also hardly a spring chicken. Age then, does not have to be the limiting factor. So, perhaps let’s not focus on when the current world No 3 is going to swap rackets for rattles on a full-time basis, and not note every change, every loss, every step down the staircase of decline in the way that sports fans love to do. It may be a long shot, but don’t count Federer out of further grand-slam glory just yet. In elite tennis, there is almost an unhealthy obsession with age. Federer aside, look at other top players in the men’s and women’s game that retired- Bjorn Bjorg at 25, Martina Hingis retired came back and then retired again, Aranxta Sanchez-Vicario was only in her mid-20s when she quit. Federer still has goals to achieve in the game, not only in terms of trying to regain the No.1 spot but overtaking Jack Nicklaus’ record of 18 Majors which despite it being a golfing record, is a milestone for any top tennis or golf player. Of course once the Nadal-Federer duopoly was broken up, one was bound to slip down the rankings. I am a Federerphile but we will have to see how he performs the rest of the year starting with the US Open. This is the first time since 2002 he hasn’t won a Grand Slam I believe, but his forehand, serve and backhand are still big weapons and he is never flustered- always calm and composed. Novak Djokovic retired in the final at Cincinnati and maybe the schedule might be starting to take its toll- would love it to be a Djokovic vs Federer US Open Final but we shall see. 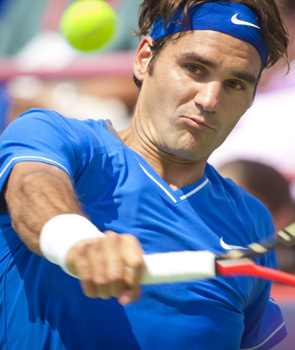 Federer is a master and this article very informative. I hope you are correct Alex and we see Roger with more major titles added.